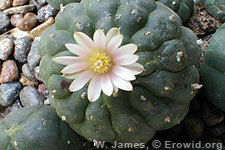 Peyote is a small, spineless cactus that contains mescaline as its primary active chemical. It has a long history of use among the natives of northern Mexico and SW United States. Is Lophophora diffusa legal in the U.S.? Are peyote seeds legal in the US? Does peyote contain poisonous alkaloids? Is peyote legal in Canada? Personality, History, and Dignity, by Christopher K.